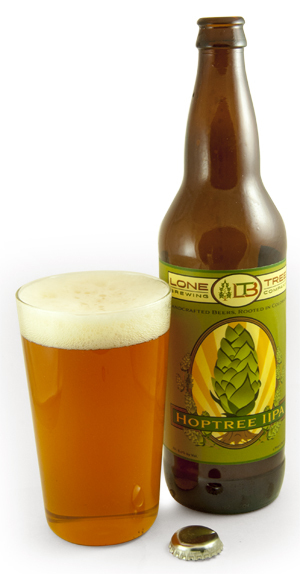 Hoptree IIPA is brewed with two-row, dextrin, honey and acidulated malts. It is hopped with CTZ, Nugget, Centennial, Cascade, Crystal and Amarillo hops. Well, hello, you. Your hoppy goodness leapt out to greet me as soon as I popped off your cap—slightly grassy, slightly citrusy; totally intriguing. You’re handsome, too, all bright and brassy with a ring of off-white foam. One sip and I’m hooked, with a fruity, tangerine introduction that sneaks into a more pine-and-grapefruit bitterness near the end. Never cloying or sticky-sweet; a touch of caramel and honey keep the hops in check, yet that bitterness does linger long after the swallow. Packaged in a 22-ounce bottle that could be shared, but I plan on keeping you all to myself. This beer shows a pleasant full-gold color, with low carbonation and little foam. The aroma is grassy and floral with a hint of sage. On the palate there’s plenty of bitterness, but it’s softened by a full-malt center, lending the beer some roundness along with its racy minerality. The finish is clipped, dry and clean. It’s not the flashiest of the bunch out there, but it’s actually really fresh, tasty and well-made. It’s nice to see that those qualities count with this brewery, and if I had a Thai shrimp curry on hand, all might be pretty perfect.